I work from home, and I have what is possibly the most uncomfortable desk chair in the world. Because of that, I spend less time in front of a computer now than I have in years, and even though I plan to upgrade the chair eventually, I have secretly appreciated the motivation to stand up and move around. So while I still do my final writing and editing work on a laptop, a lot of my preparation — jotting down notes, collecting research, outlining drafts, etc. — is done using my phone or my tablet. If my brain won’t turn off as I’m trying to sleep, I open Squarespace Note, type out whatever thoughts are jumbling around, swipe up, and relax. I have my “swipe up” setting configured to email me whatever content I just typed, which makes the app like a virtual Post-It note but always legible and always in the same place (my email inbox, not the crevice between my bed and my nightstand). The “swipe up” feature can also be configured to send to Evernote, Google Drive, Dropbox, or a Squarespace blog; you can even have multiple destinations and mix and match on a whim. The MindNode app is a recent addition for me (and only because Starbucks offered it as a free download), but I can already see how useful it will be. 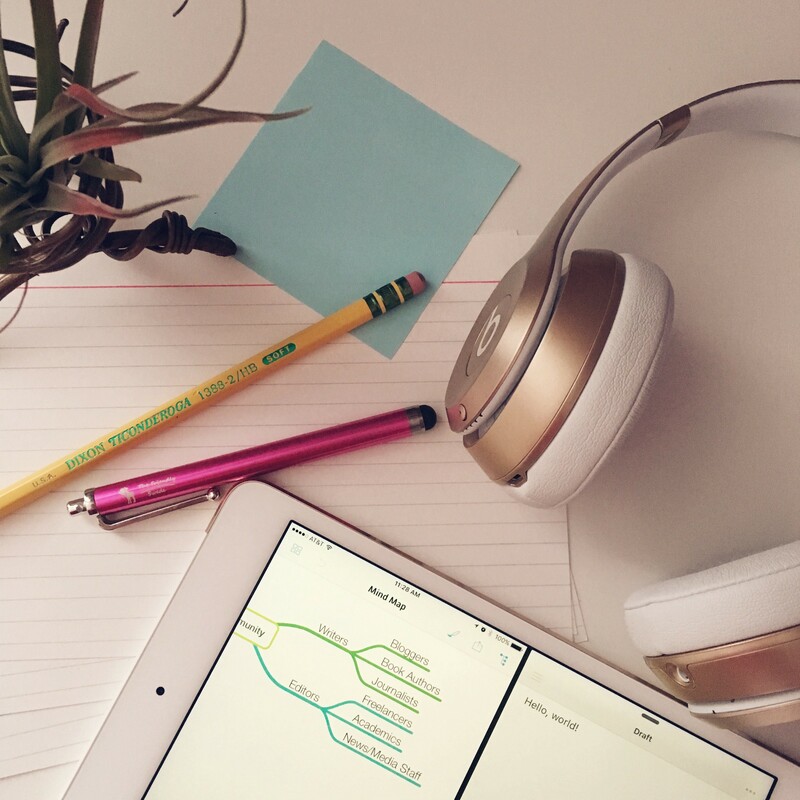 Normally, I shy away from mind maps and other forms of brainstorming that can’t be neatly contained on a single index card, but the MindNode app gives me the tidiness I crave while encouraging flexibility and creativity. It’s a great way to outline a story, create a diagram of the audience you want to reach, set goals, etc. Read this article from The Sweet Setup for a more comprehensive review. The OneNote app has replaced Evernote for me as my go-to place for storing and organizing notes and reference materials. In large part, this is because the colored, horizontally-aligned tabs of OneNote make a lot more sense to me than the never-ending clusters of document titles in Evernote. Because I can visualize where my content is stored, the process of organizing and then later retrieving my information is a lot easier (and more pleasant). I keep my blog post ideas in OneNote along with quotes from books, articles, and podcasts. Because OneNote syncs across all my devices, I can add to those notes from my mobile devices and then use them at my laptop when I’m ready to write or edit. There are many great mobile text editors on the market, but Byword is my personal favorite. (It’s also The Sweet Setup’s favorite Markdown writing app for the iPhone.) It syncs flawlessly between multiple devices, so I can start a document on my phone whenever inspiration strikes, work on it from my tablet while I’m waiting for a meeting to start, and then put the finishing touches in place from my laptop. It is simple to use and gives me access to formatting features, document search, word count, and more, yet it is cleverly designed to get out of the way when I need to write without distractions. The Omni Group makes phenomenal apps, and OmniOutliner is no exception. Their description sums it up perfectly: “a start-to-finish writing app.” I particularly like OmniOutliner for long-form writing, when I know I will want to add structure to a document and rearrange it as the piece develops. Work with the document as a whole — highlight, indent, search, format, and style — or split the piece into sections for better focus. Again, there is plenty of power and flexibility within the app to do what I want, but none of it gets in the way of the writing process. As a proofreader and copy editor, I spend a lot of time referencing a dictionary (I frequently mess up the number of double consonants in “millennium”) and a thesaurus (maybe “loquacious” isn’t quite as good a fit as “elaborate”). Merriam-Webster is highly regarded among professional writers and editors, so I greatly appreciate the work they’ve invested in creating and maintaining quality mobile apps. If I want to do serious mark-ups on a digital manuscript, I will save the document as a PDF, open it in PDFpen 2 on my iPad, and trade in my red pen for a red stylus. The app allows me to draw directly on the PDF, so I can cross out an unwieldy paragraph and make a note about it in the margin without needing a printer, paper, or a pen. This has become my preferred way to do the first round of edits when I can’t work on a paper copy, since the physical act of doodling helps me recognize big patterns (frequently crossing out a certain phrase, fixing capitalization on a certain word, etc.). The app has many other features, like text editing and password protection, making it a great investment for anyone who works with PDFs. I hope these apps help you with your writing and editing! Leave a comment if I missed anything or if you want to talk more the apps I listed. P.S. I currently have availability for copy editing jobs or proofreading jobs. Start here.